From time to time, we are all writers. We all post and email and some of us prepare documents to communicate ideas or information. Writing can be a lonely activity: it feels like it's just you and the computer screen. As you try to wrestle your information into words, your vision might close in until there is nothing but you and the screen you are filling with your words. This is a terrible way to think about writing. Even your personal journal will make a better contribution to your well-being if you look up and around. You are not writing alone: you are writing because you are not alone. Even if the person who will read your writing is another version of you, you are writing so that someone can read what you have written and make sense of the world differently because of it. It's hard to feel comfortable in the space between stimulus and response. It's a passageway, not a resting place and not a highway. As this fall turns into winter, we are aware of being in that space of uncertainty and possibility. It is time to make some choices, to move through the passageway and into new action. A new season, a new year and, possibly, a new era are almost upon us. It is time to choose. If you're not sure what choices are possible, begin to label what is real right now. What do you feel? What do you know? What do you want? Find a way to record your answers: write on paper or on a computer, sketch them, talk them through with a friend. No picture in the post this week, and no politics. Just three communication principles applied to the US Election results. The first principle: matching states (pun unavoidable) creates rapport. Trump matched a mood of discontent and anger that is apparently epidemic throughout most of the states (as in United States). Literally, he won because he matched the state in more states (that's the way the Electoral College works). It's not clear to me that Trump did more than mirror: I haven't seen evidence that he can lead from the state he has matched into a more useful state. But when people looked at him, they saw their own state reflected back. Since states shared are states amplified, he has successfully created a wave of anger and discontent and that wave has carried him into office. There are two good reasons that I both sponsor and attend The Steel City Jazz Festival. One is that my kid runs the festival. It was his dream and he has made it real for the past four years. Hanging out with anyone who has achieved a dream is inspiring. Hanging out with your kid while he makes his dream real is a rare and wonderful opportunity. 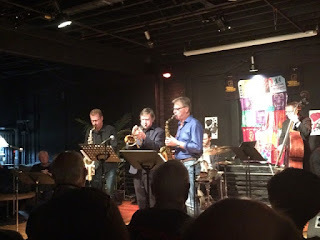 The second good reason that I like to listen to improvised jazz is that it reminds me that a VUCA (volatility, uncertainty, complexity, ambiguity) situation could be really good fun. I took this picture last night while watching a sextet stand in the shoes of giants as they played the music from Miles Davis's Kind of Blue recording. If you're not a jazz fan, here is what that means. For more than an hour they played very famous jazz pieces and they were improvising.